Occasional Vomiting: Should You Be Concerned? When a cat vomits, I feel like it impacts me in one of two ways. Either it sends a shiver down my spine when I hear that unmistakable hacking noise, or it sends a shiver up my spine (starting in my foot) if I happen to step into it by mistake. No matter how we come to find that our cat has vomited, sometimes we just chalk it up to our cat just being a cat. But should we really view occasional vomiting as a normal behavior? Some of us are simply used to our cat vomiting often. So, when our veterinarian asks if our cat has been vomiting, we may answer “No more than usual.” But the truth is frequent vomiting is not normal behavior for a cat, so there may be an underlying health issue. If your cat vomits more than once every two months, you may want to consult your vet. There’s also a misconception that cats will vomit after eating too fast. I think this is another example from us making a false conclusion from an observation. I mean, just think about it – have you ever vomited from eating too fast? Likely you haven’t, unless there was an existing gastrointestinal disorder that would cause it. The same applies to your cats. Lastly, cats are particular because some vomiting may involve only food, other vomiting may only result in hairballs. Some vomiting episodes may involve both. Here’s what you need to know about that. True hairballs only involve hair: They usually come out as a tubular mass. That said, if your cat vomits up hairballs often (twice a week or so), that’s a great deal of hair that your cat is coughing up. 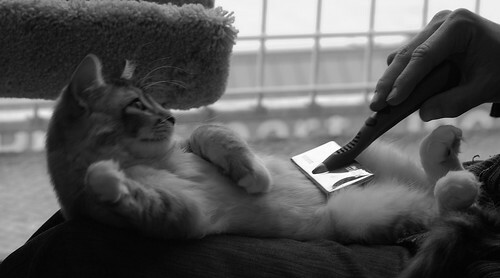 You may want to help your cat out a bit and groom him daily. That should cut down on the hairballs. Most consumed hair should pass naturally through your cat’s system. Other “hairballs” that include food, actually aren’t hairballs, but vomit. Again, if this is happening often in your household (more than twice every two months), you may want to take your cat in to get checked out. What’s so bad about the occasional vomit session you may ask? Chronic vomiting may be a result of serious health issues including organ dysfunction, pancreas inflammation, inflammatory bowel disease, gall badder disorders and cancer.